To replicate and scale-up peer support interventions for people with severe mental illness. A large number of people with severe mental illness receive no treatment1,2. This treatment gap is the largest in low- and middle- income countries (LMIC)3, with detrimental effects on individuals and societies. Mental health peer support is an established intervention involving the delivery of mental health services by people in recovery from mental illness. Peers are an untapped resource in global mental health and there is a burgeoning body of evidence4 for the effectiveness of this approach when integrating into mental health service delivery. Evidence for best practice will be disseminated to local, national and international stakeholders ensuring sustainability and coverage. Evaluation with about 516 participants at the levels of service users and peer support workers, services, and implementation. This includes outcomes such as social inclusion, empowerment, recovery and quality of life at the level of service users; professional development at the level of peer support workers; and recovery-related knowledge, attitudes and practices at the level of services. In addition, implementation outcomes such as acceptability, appropriateness, feasibility, costs, coverage, fidelity adoption and sustainability will be evaluated. To establish an international community of practice for peer support across high-, middle- and low-resource settings. To conduct a situational analysis of existing peer support initiatives in the participating countries. To contextualize and adapt peer support models for those sites where there are no peer support initiatives. By adapting existing tools, materials and strategies from demonstration centres to ensure cultural and situational appropriateness, or creating new ones, as needed. To distil from case studies evidence of best practice for dissemination to local, national and international stakeholders in order to maximise sustainability and spread. By engaging with diverse national and local advisory boards including service users, carers, senior clinical staff members, representatives of Health Ministries, hospital directors, community leaders, and a Communications Taskforce. The major challenge is to coordinate the research across all sites in different countries. The current stage of peer support implementation and the key features of peer support vary between sites. At the same time, UPSIDES will benefit from this variance, as all sites will learn from each other. UPSIDES will make available a sustainable intervention by producing guidance for other low-, middle- and high- income countries to initiate peer support programmes. The main UPSIDES deliverable, i.e. an evidence-based cross-cultural implementation strategy for peer support in mental health care settings, will be transferrable with some adaptations to other countries (mostly, but not exclusively low- and middle-income countries). This process will be facilitated by UPSIDES team members beyond the duration of the project and the UPSIDES dissemination strategy which will support sustainable change in policy and practice. The information on this website reflects only the authors’ view. The Commission is not responsible for any use that may be made of the information it contains. The UPSIDES project is subsidized over five years (2018 to 2022) with three million Euros (about $3.45 million) from the European Union (EU) Funding for the Indian study site is provided by the Indian Council of Medical Research in collaboration with the Global Alliance for Chronic Diseases (GACD). UPSIDES has started in January 2018. Research tasks in the early work packages to assess the current stage of implementation of peer support, intervention development and translation have already started. The project team is currently undertaking initial action to prepare the ground for the later work package evaluation. Recovery-related knowledge, attitudes and practices at the level of services. Additionally, implementation outcomes such as acceptability, appropriateness, feasibility, costs, coverage, fidelity adoption and sustainability will also be evaluated. 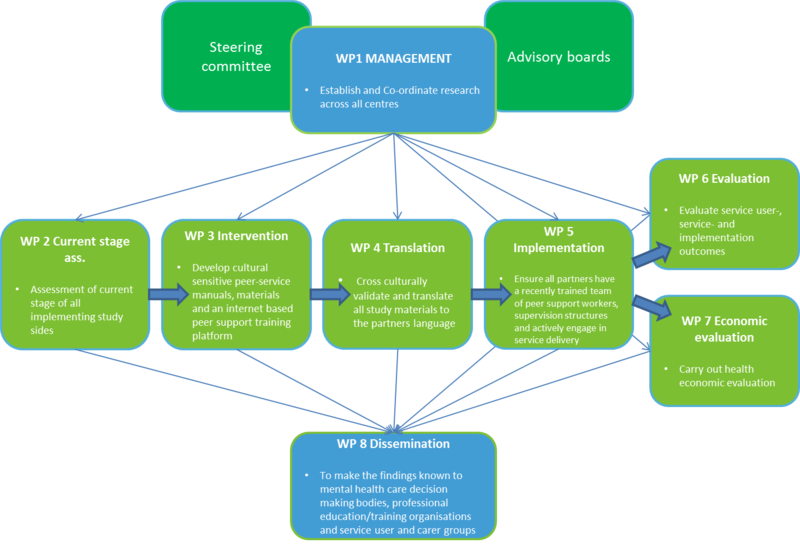 The WHO World Mental Health Survey Consortium. (2004) Prevalence, severity, and unmet need for treatment of mental disorders in the world health organization world mental health surveys. JAMA, 291:2581–2590. Wang PS et al. (2007) Use of mental health services for anxiety, mood, and substance disorders in 17 countries in the WHO world mental health surveys. Lancet, 370:841–850. doi:10.1016/S0140-6736(07)61414-7. Patel V et al. (2007) Treatment and prevention of mental disorders in low-income and middle-income countries. Lancet, 370:991–1005. Davidson L, Bellamy C, Guy K, Miller R. Peer support among persons with severe mental illnesses: a review of evidence and experience. World psychiatry. 2012 Jun;11(2):123-8.